Since Games Workshop opened the floodgates, and started giving their well-love Warhammer 40,000 IP licence to many more developers, the games we’ve been getting have been highly variable in quality. While there have been successes there have been many more games which have been outright bad or mediocre. This medley of games has covered many genres, and while there have been turn-based strategy games there’s not been anything much like Mechanicus. In this new game from Bulwark Studios, you command the forces of the Adeptus Mechanics; the machine-worshipping maintainers of the best of the Imperium of Man’s technology. While it is common in 40K games to be playing as the Imperium the Mechanicus, this is a much rarer choice – which should appeal to many fans. The campaign sets the stage for some interesting interplay within the various factions within the Adeptus Mechanicus. Gamers will find some of their advisors swaying towards the fervent techno-religious aspect of the machine cult, while others are more open to studying alien technology. The most frequently used antagonist in 40K games are the Orks, but Mechanicus has instead opted for the Necrons, which to put it simply are a very technologically advanced race of robotic skeletons. The game takes place on a Necron tomb-world, which provides a rationale for the limited time you have to complete the campaign. Effectively, you need to achieve your goals before too many of the Necrons awake from their millennia of slumber. Structurally there are several layers to Mechanicus’ gameplay, but the inevitable comparison is to the XCOM series. 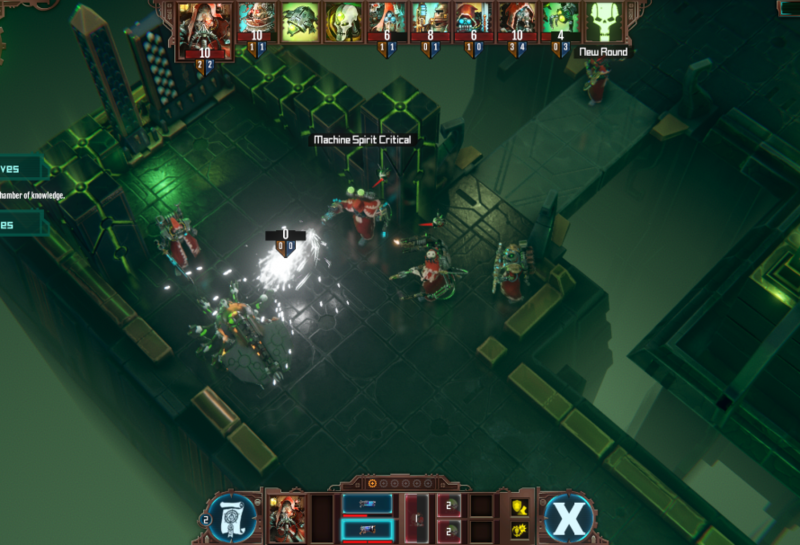 The heart of the game is a turn-based, gird-based strategy game at the squad level, giving you control of a team of tech-priests and their minions. The game opens with some lengthy cutscenes, all with text to read in order to tell the story rather than voiced lines. At the start of the game this feels a little much, even for those used to text-heavy games. Thankfully, later on the reliance on text becomes more reasonable as you aren’t required to read so much at once. Just like in XCOM you have a base to operate from. Due to the nature of the 40K universe this is on something of a more impressive scale though. From here you select missions to complete and manage the advancement of your troops through a variety of specialisations and new equipment. Much of the replayability of the game hinges on this system, and from the limited look at it available in the preview build it does seem deep enough to offer genuinely different ways to build out your troops, rewarding additional playthroughs. When you start a mission you are presented with a stylised map of rooms which act as movement nodes – rather than being dropped into a tactical map. This is done as you are exploring a larger area in each mission, which includes more than just combat. The progression through rooms as you complete the mission feels much like Darkest Dungeon, and is a welcome twist on the formula. Frequently rooms will present you with a choice to make – such as whether you examine the strange alien coffins, burn them or ignore them. Having this room-by-room exploration mechanic break ups the combat encounters that occupy most of the mission time, and gives a sense that you are in control of more than just who shoots whom in what order even during missions, which is nice. 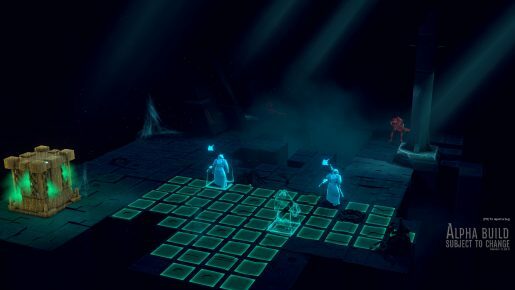 Once you move to a room with enemies in it (you can see that there are enemies before moving though not how many or what types) you’ll be sent to the tactical map for traditional turn-based combat. The biggest difference between Mechanicus and the likes of XCOM is the lack of a cover system, which initially feels a bit odd. Instead of making different areas of the map more valuable due to cover/elevation in Mechanicus there are objects that give your units cognition points when you start a turn standing next to them. These cognition points (CP) are the cornerstone of the combat system and are used to fuel all of the most interesting abilities your units have at their disposal. While CP regenerates over time exploiting the sources on the map properly dramatically increase the damage potential of your units. Another use for CP is to grant your troops additional movement, allowing them to cover a lot more ground very quickly. Overall the tactical combat feels well implemented though it is a little hampered by the not terribly interesting maps which were available in the preview build. Necron architecture doesn’t lend itself to vibrant and varied level design so this is somewhat to be expected. Regrettably, this is further hampered by having to use the ‘Noosphere’ visualisation mode much of the time. 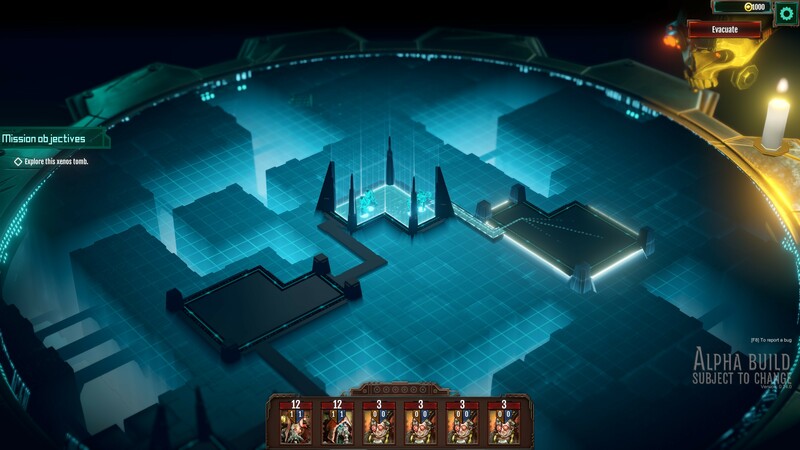 The Noosphere mode renders the map as a traditional Tron-esque virtual reality version of the map, showing a minimalistic grid layout of the map and the units on it. This mode activates when you use many of the tech priest abilities, presumably to make it clearer which unit you are targeting, but in practice it makes the game less visually interesting for no significant increase in clarity. While the tactical maps aren’t particularly interesting the overall presentation of the game is good, and perfectly depicts the grimdark Warhammer 40,000 setting. The user interface for the game works well and is generally clear and easy to use. There aren’t many video settings to play with but the game ran well, and properly scales the interface for use with high resolution monitors at least up to 3840×2160. 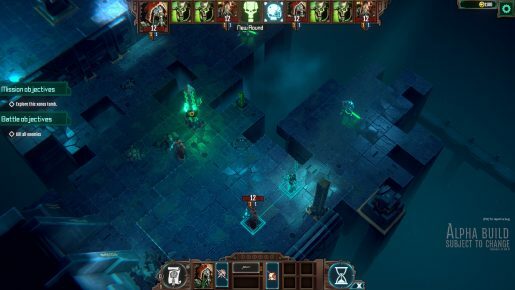 Judging from this preview build Mechanicus is one of the most promising titles the Warhammer 40,000 setting has coming in the near future and I look forward to seeing what the full game has in store. Mechanicus is set to release on for Windows on Steam on the 15th of November for the price of £20.69 or regional equivalent, including a 10% pre-order discount.